As the congressional debate over President Donald Trump’s tax overhaul begins, more Americans say tax rates on corporations and higher-income households should be raised rather than lowered. About a quarter of U.S. adults (24%) say tax rates on corporations and large businesses should be lowered, while roughly twice as many (52%) say they should be raised. Another 21% say corporate tax rates should be kept the same as they are now. There is less public support for raising taxes on higher-income households. However, as with tax rates on corporations, just 24% say taxes on incomes over $250,000 should be reduced; 43% say they should be raised, while 29% favor keeping them the same as they are currently, according to a Pew Research Center survey conducted Aug. 15-21 among 1,893 adults. Majorities of Democrats and Democratic-leaning independents favor raising tax rates on both corporations (69%) and high incomes (57%), while Republicans are more divided. 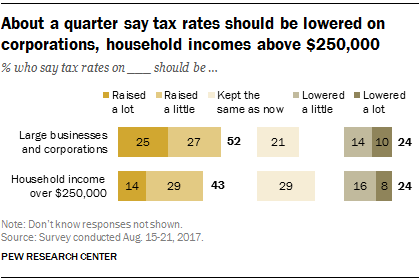 Among Republicans and Republican leaners, 41% say tax rates on corporations and large businesses should be lowered, while 32% say they should be raised (23% want them kept as they are). And only about a third of Republicans (36%) say tax rates on household incomes above $250,000 should be reduced; nearly as many (33%) say they should be kept as they are and 26% want them raised. There is more support for tax cuts for corporations among conservative Republicans (48%) than among moderate and liberal Republicans (28%). Similarly, conservative Republicans (41%) are more likely than GOP moderates and liberals (28%) to favor reducing taxes on household incomes above $250,000. Democrats, regardless of ideology, support higher tax rates on corporations. But while 70% of liberal Democrats say tax rates on household incomes over $250,000 should be raised, fewer than half of conservative and moderate Democrats (46%) say the same. Among the public overall, there are only modest income differences in views of what should be done with tax rates for corporations and high incomes. For example, a 41% plurality of those with family incomes of $100,000 or more say tax rates on high incomes should be raised; 29% say they should be kept the same as now, while 27% say they should be lowered. These are comparable to opinions among those with lower family incomes. Among Republicans, however, there are sizable differences in views of taxes by income. 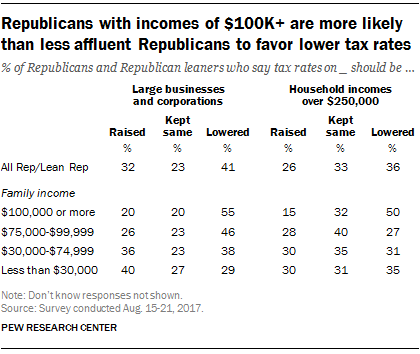 More than half (55%) of Republicans and Republican leaners with family incomes of $100,000 or more favor cutting tax rates on corporations and large businesses, as do 46% of those with incomes between $75,000 and $99,999. Republicans with lower incomes are more divided. The differences are also stark in Republicans’ views of tax rates on household incomes over $250,000. Half of Republicans (50%) with family incomes of $100,000 or more favor cutting tax rates on high incomes, compared with no more than about a third of Republicans in lower income categories. 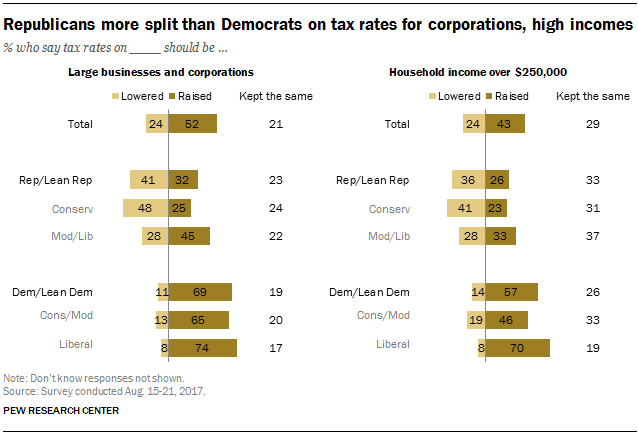 Large majorities of Democrats, across income categories, say tax rates on taxes on corporations and large businesses should be increased. Yet lower-income Democrats are less likely than higher-income Democrats to say tax rates on high-income households should be raised (47% of those earning under $30,000 vs. 63% of those earning $30,000 or more). Note: The full topline can be found here (PDF), and methodology is here.